Stevie Van Zandt, an original member of Bruce Springsteen and the E Street Band, stopped in Denver on his latest tour, which is dedicated to teachers. DENVER — He’s best known as the guitar player and original member of Bruce Springsteen and the E Street Band. He’s also pretty well known for playing Silvio Dante on the TV show The Sopranos. Over the weekend, Stevie Van Zandt brought his own band, “The Disciples of Soul,” to Denver for a show, but that was only part of the reason he was here. "Little Steven," as he’s known, dedicated this tour to teachers. He said they are the most overworked, underpaid people in America. Before the show at the Gothic Theatre, he held a workshop to introduce teachers to his new online curriculum adding music to the classroom. Van Zandt said the emphasis on STEM (science, technology, engineering and mathematics) is great, but it needs to be "STEAM." He said he thinks the arts are just as important, and the best way to teach students not what to think, but how to think. After the workshop, the teachers were invited to stay for his show for free. Before the show, Van Zandt met with music students at the Fred N. Thomas Career Education Center in Denver. His message was part tough love, part music history and partly his incredible sense of humor. He told the students this is a very difficult time in the music industry, and making money by recording music is nearly impossible unless you’re a superstar. Difficult, but not impossible. His advice was too slow down, buckle down, study, work, practice and hone your craft. For more information on Little Steven’s music program for classrooms: TeachRock.org. For more information on a local group that works to get instruments and music into classrooms: TakeNoteColorado.org. Writer's note: I’ve been a fan of Bruce Springsteen and the E Street Band since I first saw them in the 70’s. Stevie has always been a music icon to me. Meeting him for just a few minutes was a hoot. And after learning more about his off stage dedication to students and teachers, I respect him even more than I did before. 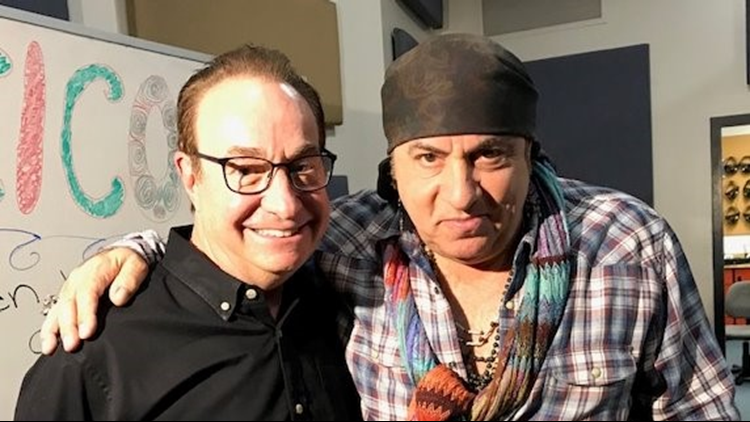 9NEWS Anchor Gary Shapiro (left) and Stevie Van Zandt.